Teal is one of my favourite colours, and I'm a total sucker for glitter, which means I pretty much have no choice but to love Revlon Radiant. I'm wearing two coats of it here, over OPI Fly. They're both the slightest bit greener than I was able to capture, but they're so well suited for each other--practically a perfect match! Radiant is predominantly made up of small, teal glitters, but it's also sprinkled with medium glitters in silver and green. It could probably be built up to wear on its own, but I love this layered look. 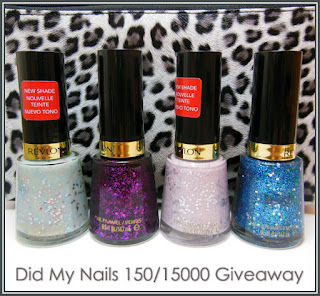 Radiant is one of 4 Revlon glitters in my current giveaway! 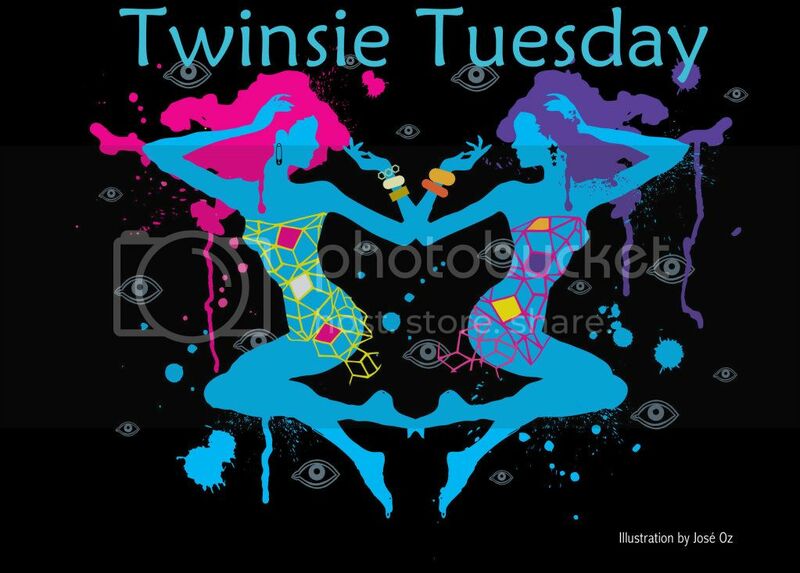 Welcome to another Twinsie Tuesday post! This week we're supposed to paint our nails the same colour as our car. Only I haven't had a car since we moved to Hong Kong over 5 years ago. What I have instead is taxis. 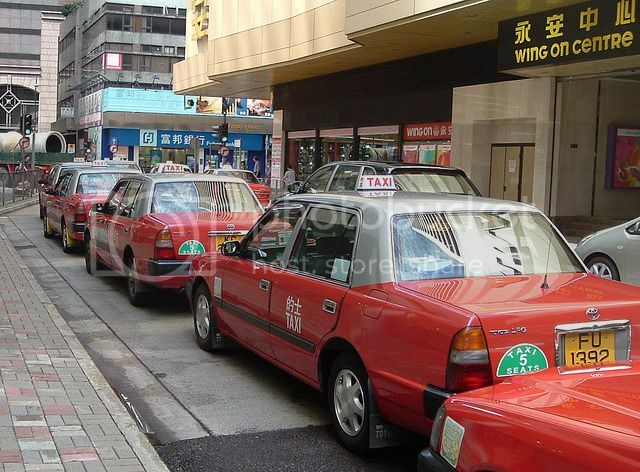 Lots and lots of taxis. I could easily have painted my nails a bright red and called it a day (would have made my day a lot shorter, that's for sure), but I decided to get a little creative and try some Hong Kong taxi nail art instead. This giveaway is closed. Thank you so much to everyone who visited and entered! 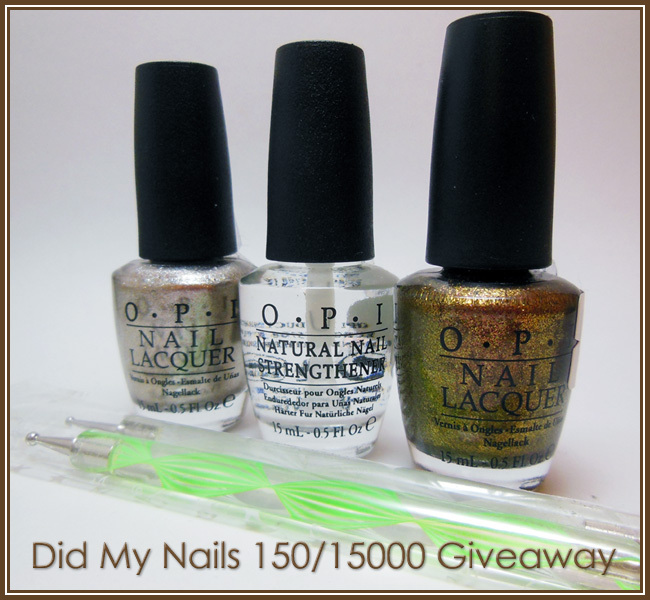 After crossing 150 blog followers and 15,000 pageviews earlier this week, I decided it was high time to have my first giveaway! Thank you so, so much to everyone who has visited Did My Nails! Nail blogging has been so much fun, all thanks to you guys, so I thought this would be a good time to express my gratitude by giving away some stuff. Yay, free stuff! Before I start on today's manicure I'd like to say a quick but sincere thank you to everyone who has visited Did My Nails. Yesterday marked both 150 blog followers and 15,000 page views, which obviously couldn't have happened without you guys stopping by. 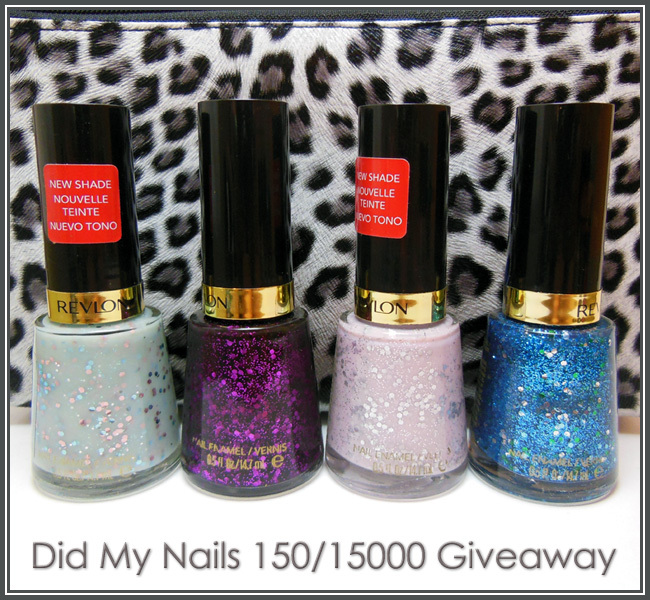 To celebrate I'll be announcing my first giveaway later this week! But first, today's Twinsie Tuesday nails, and this week's theme is Rainbow. Not only am I down with another icky, congested cold, but after two huge nail breaks on my photo hand in the past 24 hours (the horror!) I definitely needed something a little bright and cheerful to pick me up. This theme just might have done the trick! As satisfying as it is when a plan comes together, sometimes it's fun just to play around and see what happens instead. For more, please visit Amanda's awesome blog! I finally found the Deborah Lippmann counter, and the first one of her polishes I had to have was Mermaid's Dream. I'd fallen so completely in love with all the swatches I'd seen of this little beauty online that I kept trying to talk myself down before I put it on, telling myself not to be too disappointed if it didn't live up to all my expectations, but it was every bit as pretty in person as I hoped it would be. Even though I'm ready for some deep, rich autumn colours, I keep coming back to the bright shades of spring and summer like this one, Grass Slipper, from the Sally Hansen Complete Salon Manicure line. I think I'd love it for the name alone, but I'm crazy about the colour too. This springtime, grassy green has a touch of acid/neon lime that really gives it an extra kick. Today's TT theme is a copycat surprise! With names drawn like Secret Santas, the assignment was to copy a manicure posted by another Twinsie. Everyone else got assignments via Elfster, but since I was new Twinsie on the block and came in late I got to pick my name out of a hat. And I picked...Chelsea! 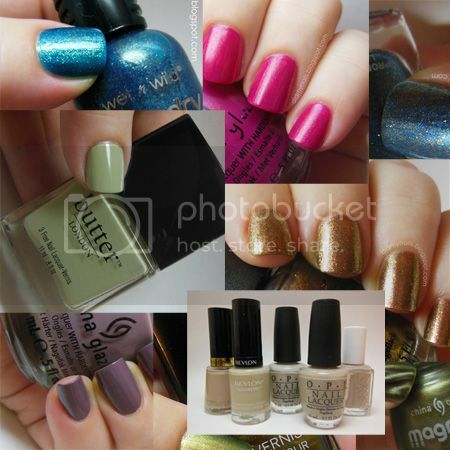 Chelsea has so many beautiful swatches and layering combinations on Nailed, but one that particularly caught my eye was this one from June, featuring China Glaze Recycle and OPI Pirouette My Whistle. I've had both of these polishes for a while and love each on its own but never thought to put them together. Recycle is a great medium grey, not so dark that it overpowers the delicate, somewhat translucent glitter of Pirouette My Whistle but still dark enough that it contrasts nicely and shows off the little micro-glitter pieces that sometimes get lost against a lighter polish. It also gives it a little bit of a grungy look, which I really, really like. Very cool combo, Chelsea! I'm extra excited this week to see what everyone else did for this assignment! Because she posted hers early, I already got to squee at the awesome interpretation Ashley did of the dandelion nails I posted a couple of months ago. 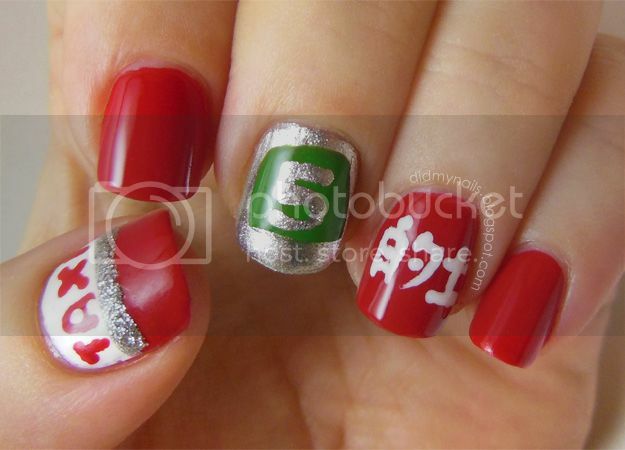 And with double-duty this week, she also did some fabulous Hunger Games nails a la Tara! It's so sparkly! Here's a polish I wore a little while back, Big Money from the Sally Hansen Gem Crush line, a full-coating glitter in soft, shimmery gold with brilliant lavender highlights. We just spent a couple of days out at Hong Kong Disneyland, and I couldn't think of a more appropriate polish to wear there than Sinful Colors Cinderella. 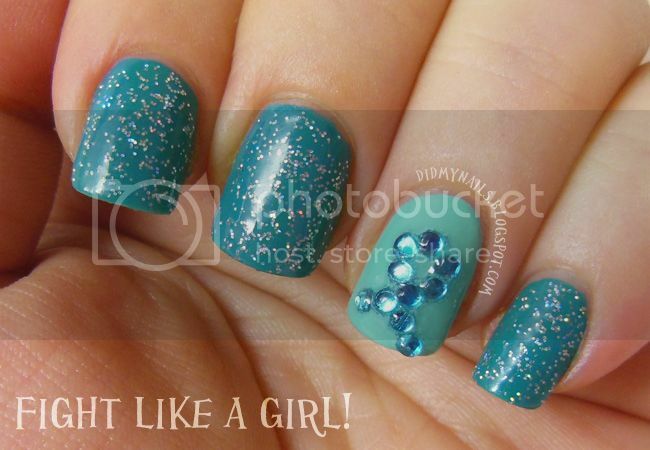 Cinderella has been all over the nail blog world for what seems like ages. If you aren't familiar with it, it's a soft, semi-sheer blue with a pretty pink shimmer. It's also one of those polishes that's hard to do justice to in pictures because the shimmer is so much more prominent than I was able to capture. But not for lack of trying! Now that I've done a crazy, spotted poison frog, I thought it was time to try my hand at a saner, hopefully simpler animal pattern and give zebra stripe nails a try. With China Glaze Kalahari Kiss already on my nails, I just grabbed a white nail art striper and went for it. It turned out to be easier than I expected! All I did was take turns painting from each direction, sometimes splitting the line like a fork in the road, and just trying not to leave any big gaps between stripes. Today's nails are dedicated to Nory, who has inspired and organized a group posting today for the start of PCOS Awareness Month. 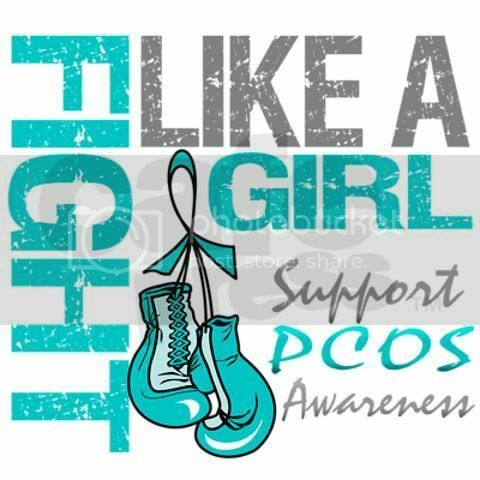 PCOS stands for Polycistic Ovary/Ovarian Syndrome, a surprisingly common endocrine disorder and hormonal imbalance affecting as many as 10% of women. Thought to be primarily caused by a resistance to insulin, PCOS is a leading cause of infertility, but that's a secondary symptom. Main symptoms can include weight gain, irregular or excessive periods, excessive hair growth (while the hair on your head may actually be thinning), fatigue, depression, acne, and the somewhat-mislabeled ovarian cysts for which the syndrome is named. There isn't an actual cure for PCOS, but diagnosis, treatment, and some lifestyle changes can make a huge difference in managing it, as well as greatly improving the health and daily life of those affected by this condition. To that end, Nory suggested doing "PCOS Awareness" nails today to get the word out, to encourage women who might be affected to seek diagnosis and treatement, and to let them know that they aren't alone. And of course, Nory's personal blog about her fight against PCOS, Nory's Journey to Health.